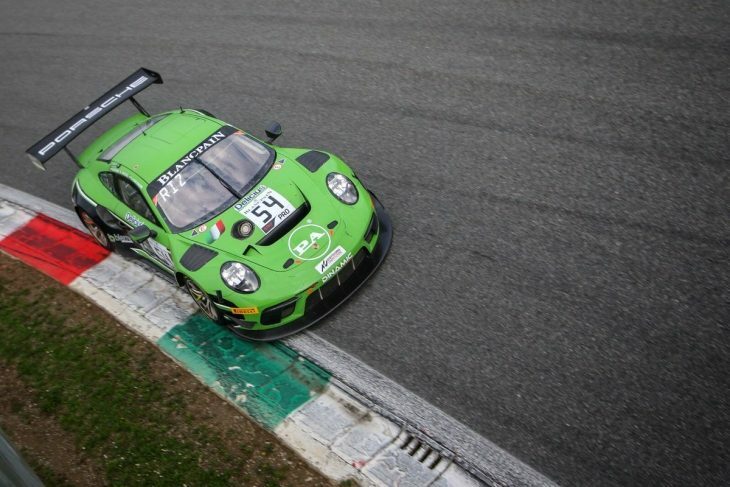 The #54 Dinamic Motorsport Porsche team of Klaus Bachler, Andrea Rizzoli and Zaid Ashkanani took victory in the first round of the Blancpain GT Series Endurance Cup at Monza. 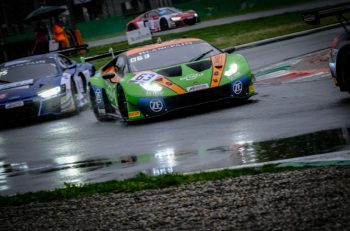 The Italian outfit lined-up a lowly 23rd on the grid for the three-hour race, which was contested in mixed conditions, but a mix of great driving, troubles for those around them and opportunistic strategy gave the team the win at home, ahead of the #563 Orange 1 FFF Racing Lamborghini of Marco Mapelli, Dennis Lind and Andrea Caldarelli. The #4 Black Falcon Mercedes of Maro Engel, Luca Stolz and Yelmer Buurman rounded out the overall podium. 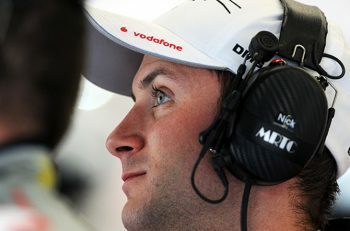 46 cars took the start, after the withdrawal of the #17 WRT Audi in qualifying. Sadly, the #20 GPX Racing Porsche that met the barriers in qualifying also withdrew from the race. The #31 Team Parker Bentley was also missing from the grid, but Derek Pierce was in the car to start it from pitlane; however, it was soon discovered that the damage from a crash in qualifying wasn’t fully rectified, so the British firm had to retire their Bentley after seven laps, just a week on from the highs of a successful British Touring Car season opener. Nonetheless, the tremendous entry expected of the Blancpain GT Series Endurance Cup was present and correct. The weather, while not torrential as had been seen in qualifying, was still exceedingly wet, though it would come close to drying out over the course of the first hour. Relief came for some in the mid-pack came with the news that the race would start under the safety car, negating the risk of any typical Monza first chicane drama. Two laps were recorded behind the safety car, and then the green flags waved with six minutes of the race elapsed. For the most part, all of the cars stayed in grid order at early doors. Polesitter Mirko Bortolotti (#63 GRT Grasser Lamborghini) built a gap in the early laps; after ten minutes of green flag running, the Italian held three seconds over Nico Bastian in the Silver Cup-leading #90 AKKA Mercedes, who in turn was being hounded by the #2 Belgian Audi Club WRT R8 of Alex Riberas. On lap one, Dennis Lind received a nudge in the #563 Orange 1 FFF Lamborghini, from the similar #78 Barwell Huracan driven by James Pull. The Lesmo 2 gravel awaited, but fortunately, Lind got back out under his own steam, albeit dropping from fifth to 13th. Lind then went on the attack, quickly recovering to eighth place within three laps. Approaching the half-hour mark, Niek Hommerson received a heavy hit in the #52 AF Corse Ferrari courtesy of a spinning Davide Roda (#111 Antonelli Motorsport Mercedes). This incident, plus an off from the #188 Garage 59 of Alexander West at Lesmo 2, triggered a Full Course Yellow. Under the FCY, the #63 GRT Grasser Lamborghini of Bortolotti pitted to change a tyre with a slow puncture. This left Nico Bastian (#90 AKKA ASP Mercedes) the overall lead, but Bortolotti only fell to second. After several minutes of FCY, the safety car was briefly deployed, eventually releasing the field with 40 minutes elapsed. Bastian drove off into the lead while Bortolotti held off Alex Riberas in the #2 WRT Audi. Meanwhile, up to fourth place within a few corners was Dennis Lind; the charging Dane in the #563 Orange 1 FFF Lamborghini putting in a storming drive after his first lap drama. Further back, Alex Buncombe (#108 Bentley Team M-Sport) made a move on James Pull in the #78 Barwell Lamborghini for seventh. The move at the first chicane serving as the cherry atop a great first Bentley stint in Blancpain for Buncombe. With 55 minutes complete, a very brief FCY was shown, and it changed the order dramatically. Bortolotti pitted from the lead with an hour and 55 minutes to go, having pounced on Bastian after a very short FCY moments prior. Elsewhere, both Bentleys pitted and switched to slicks; with the track being greasy and a dry line barely visible, this was a gamble, though many teams followed suit and benefitted over the middle stint as a result. Rolf Ineichen (#63 GRT Grasser Lamborghini) took over from Bortolotti, and was immediately under attack from Raffaele Marciello in the #88 AKKA Mercedes; Marciello quickly dispatched the German, and then gave chase to Jake Dennis. The early-stopping #76 R-Motorsport Aston Martin was now in the lead, and, unlike the majority behind on wet tyres. Ineichen, meanwhile, started to fall through the order, struggling for grip in the #63. By the end of his stint, the Lamborghini was no longer in the top 10. A great battle between Matt Campbell (#99 ROWE Racing Porsche) and Zaid Ashkanani (#54 Dinamic Motorsport Porsche) for fourth place took the attention of most as the race approached half-distance. Ashkanani got the better of Campbell, the latter of whom seemed to struggle for traction more than his rival in an identical car. Choosing to take on dry tyres and staying out of trouble was starting to pay off for Dinamic. Meanwhile, Raffaele Marciello closed up on Jake Dennis. After a yellow flag at Ascari, Marciello used the traction from the slicks to dispatch Dennis. A lap later, Sven Muller (#98 ROWE Porsche) was on the back of the Brit, and as the pair battled, Marciello extended his lead to over six seconds in short order. As the second half of the race began, light rain was reported around the track once more, seemingly creating equilibrium between the dry and wet-shod cars. Minutes later, the PRO-AM battle combusted. Jim Pla (#87 AKKA Mercedes) and the #74 RAM Racing Mercedes driver Remon Vos made contact between the first chicane and Curva Grande. Both cars, which were battling for the class lead, were terminally damaged after hard hits with the barriers, necessitating a Full Course Yellow. The Jonathan Hui-driven #93 Tempesta Racing Ferrari took the class lead as a result. During the FCY, Jake Dennis visited pit lane for slick tyres, but only dropped from third to sixth courtesy of the slower pace. Shortly thereafter, the FCY became a safety car. The green flags waved once more with 70 minutes remaining. Marciello immediately came under pressure from Sven Muller in the #98 ROWE Porsche, and at the second chicane, Marciello ran straight over the kerbs, losing his position as a result. Ashkanani (#54 Dinamic Motorsport Porsche) quickly reels in the uncomfortable looking Italian, and takes second at the Parabolica. After several limping laps, Michael Meadows received the #88 AKKA entry from Marciello with an hour to go; according to the Italian, it was simply the dry tyres ceasing to work properly as light rain again made itself known. 59 minutes remaining, and Sven Muller pits the leading #98 ROWE Porsche to hand over to Romain Dumas. On wets, Dumas immediately comes under pressure from Klaus Bachler, who had taken over the #54 Dinamic Motorsport Porsche. Another Full Course Yellow came next, as the #9 Boutsen Ginion BMW lost a wheel at Curva Grande. The #25 Sainteloc Audi, which was yet to make its final pitstop, dives in from the lead, and because of the slow speeds, the team retained the position that it wasn’t in contention for to this point. The safety car was put out seconds later, negating any time advantage for Sainteloc and final driver Christopher Haase, but the golden ticket had still very much fallen in their collective laps. The order behind was Bachler in the Dinamic Motorsport Porsche, ROWE’s Romain Dumas, Marco Mapelli in the #563 Orange 1 FFF Racing Team Lamborghini, and the pair of Black Falcon Mercedes’; fifth-placed Maro Engel (#4) and Silver Cup-leading Gabriele Piana (#6). The race went green once more with 40 mins to go. Dumas came under attack from Mapelli and Maro Engel, at the Lesmos, they closed in on one another, and Dumas got a wheel on the gravel, allowing both of them through, as well as Michael Meadows in the #88 AKKA Mercedes, and Maxime Soulet in the #108 Bentley. Within laps, Dumas found himself down in 14th, and this downward trajectory would ultimately continue, with a later puncture resulting in a 21st place finish. With 20 minutes left on the clock, Dumas suffered his puncture, and as he exited the pits, Meadows entered with a collapsed suspension and retires. Meanwhile, Rik Breukers also arrived with a puncture in the #10 WRT Audi that had previously been second in Silver Cup; all of these issues, coincidentally, affected the left-rear of the cars. As we entered the final dozen minutes, the battle for Silver Cup honours and fifth overall was being fought between the #6 Black Falcon of Gabriele Piana, and Felipe Fraga in the #90 AKKA Mercedes. Piana went wide at Parabolica, and Fraga needed no second invitation to take, and ultimately maintain the Silver Cup lead. Seconds later, Christopher Haase begins to drop down the timing sheets and the cameras confirm yet another left-rear puncture, as the French-entered Audi rounds the second Lesmo. With half a lap to complete, Haase lost numerous positions, and the outfit would eventually finish 15th. This left Dinamic Motorsport in the hot seat. With the track drying again, and the vast majority of the field on wets, all were trying to find damp patches that were few and far between. Dinamic was among those teams, and while no one in the garage could enjoy the last lap having seen so many others fall by the wayside, there was jubilation as Klaus Bachler crossed the line to take the victory. The #54 991 GT3-R finished 15 seconds clear of Marco Mapelli in the #563 Orange 1 FFF Lamborghini, while Maro Engel (#4 Black Falcon Mercedes) rounded out the podium despite the best efforts of Felipe Fraga in the #90 AKKA Mercedes. Fraga would take Silver Cup honours from fifth-place finisher Gabriele Piana in the other Black Falcon Mercedes, while Maxime Soulet rounded out the overall top-six in the #108 M-Sport Bentley. Third in Silver Cup went to the #555 Orange 1 FFF Lamborghini of Diego Menchaca, Taylor Proto and Michele Beretta. It was an impressive 16th overall for AM winners Barwell Motorsport, whose drivers Miguel Ramos, Adrian Amstutz and Leo Machitski stayed out of trouble and matched PRO-AM teams for pace throughout. PRO-AM honours and 20th overall went the way of the #93 Tempesta Ferrari, driven by Chris Buncombe, Jonathan Hui and Chris Froggatt. The Blancpain GT Series Endurance Cup will next convene at Silverstone on 11-12 May, while the Blancpain GT World Challenge Europe will gather a week prior at Brands Hatch.